Sok Han Yong is an Associate Minister and Chinese Ministry Director of St Andrew’s Church, Kowloon. 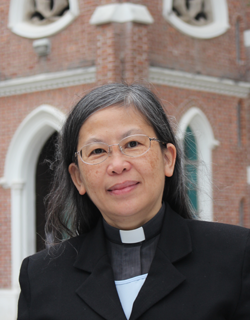 She was born in Malaysia and serve in the Diocese of West Malaysia (Anglican). She has degrees from the Seminary Theology Malaysia, Ripon College Cuddesdon and Oxford Brookes University. After long missionary service in Europe she was Ordained in the Diocese of Oxford in 2010. She has served as Associate Minister before she joined St Andrew’s Church in 2014. Sok Han is married to Kim Kee, and they have a daughter and a son who is married. She is passionate in making disciples and equipping them for mission.